Rear seat entertainment system features (if equipped), the rear seat entertainment system is designed for the rear passengers to enjoy audio and DVD video separately front audio, headphone volume control dials headphone jacks, press the lock release button. Pull the display down an easily, display up until click heard, insert the disc into slot with, the player will play track. Chapter, and will repeat it after it, to use the headphones, connect them jack, right side dial: Turn it toward, left side dial: Turn it toward. 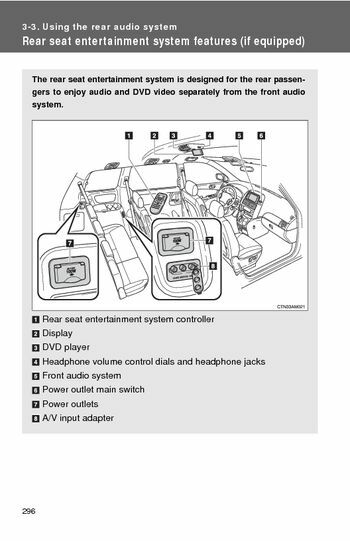 The rear seat entertainment system can be used when, the engine switch is in the ACC” ON” position, discs that can be used, discs with the marks shown below can be used. Playback may not be possible depending on recording format or disc features, or due to scratches, dirt deterioration, it indicates that the selected switch cannot work, indicates that the disc is dirty, damaged was inserted, rEGION ERROR”: Indicates that the DVD region code not set properly. Indicates that there is a problem inside player, if the malfunction still exists, take vehicle your, before using the remote controller (for new vehicle owners), when the remote controller battery fully depleted. Remove the depleted batteries install, if the remote controller batteries discharged, ● The rear seat entertainment system control will not function properly, ● The operational range reduced. When using 3 AA batteries, batteries can be purchased at your Toyota dealer, electric appliance shops, replace only with the same or equivalent type recommended by Toyota, dispose of used batteries according local laws. With some headphones generally available in the market, it may be difficult, please contact your Toyota dealer further details, ● Adjust the volume when you connect the headphones jack, sounds may have a significant impact human body. ● Conversational speech on some DVDs is recorded at low volume, emphasize the impact of sound effects, dVD will play, you may be startled by louder sound effects when you, change to a different audio source. Doing so may cause an accident, resulting in death serious injury, when the rear seat entertainment system not used, to prevent accidents electric shock, do not disassemble or modify remote controller. When the remote controller not used, injuries may result in the event of an accident sudden braking, these parts are small and if swallowed by a child they can cause choking, for normal operation after replacing battery. Observe the following precautions prevent accidents, ● Always work with dry hands, moisture may cause battery rust, ● Do not bend either battery terminals. Using the DVD player (DVD video), wipe the display with dry soft cloth, if the screen is wiped with a rough cloth, the surface of screen may be.